The Caledonia asphalt paving experts at A-1 Asphalt Inc specialize in a wide range of asphalt paving services, as well as maintenance and repair of asphalt surfaces, curbs and drains. Our professional asphalt contractors in Caledonia MI know that proper installation and maintenance of your parking lot, road or street remains vital to extending the life of the surface. We remain the leader for asphalt paving of driveways, parking lots, walkways and golf cart paths, as well as asphalt repair and sealcoating for any sized asphalt paving project. Learn more about Caledonia asphalt paving here. While most people do not get overly excited about asphalt parking lots — savvy Caledonia business owners know that their parking lot area can impact a customer’s attitude before they even walk through the door. The Caledonia MI asphalt parking lot experts at A-1 Asphalt Inc specialize in asphalt parking lot paving, as well as maintenance and repair of asphalt surfaces, curbs, drains and other surfaces. Our professional asphalt parking lot contractors know that proper installation and maintenance of your parking area remains vital to extending the life of the surface — and to the success of your business. Learn more about Caledonia parking lot paving here. Our Caledonia asphalt milling experts are fully equipped to handle any size milling or milling repair project. Let our expert milling technicians prepare your parking lot, road or street for resurfacing by removing the damaged top layer of existing asphalt. A-1 Asphalt Inc can mill from one inch to one foot of asphalt and aggregate base — using a time-tested and proven milling process that makes removal quicker, cleaner and more affordable. 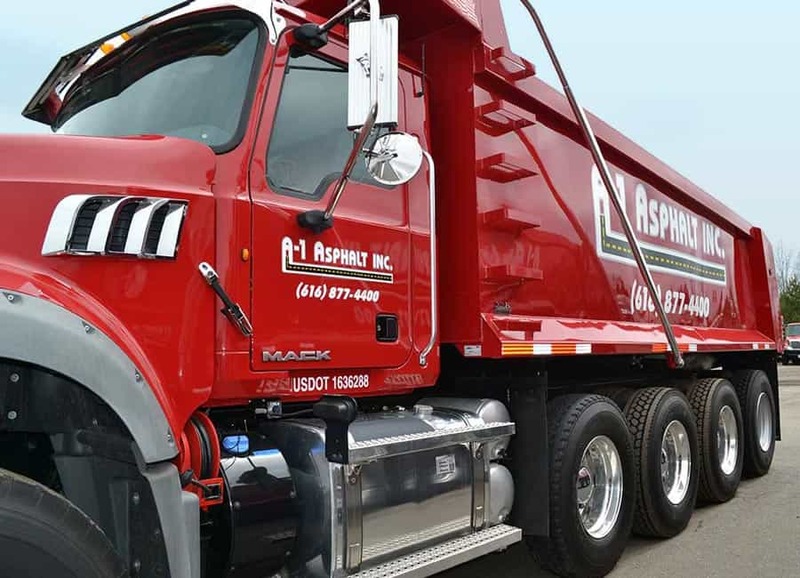 Learn more about asphalt milling & recycling here. Asphalt sealcoating remains a cost-effective and reliable option for protecting and maintaining the life of the asphalt surfaces around your home or business. Sealing your pavement will not only protect your investment, but will make your asphalt look brand new, help the surface to resist oil, gasoline and other chemicals and extend the life of your parking lot, roadway or street. Learn more about asphalt sealcoating in Caledonia MI here. Asphalt pavement marking and striping can make all the difference in the look and function of your parking area. Parking lots that are properly laid-out and painted will create a sense of safety and organization for vehicular and pedestrian traffic — and remains an essential and vital aspect of most parking lot paving projects. Even a perfect paving job can turn ugly with inadequate striping. Learn more about Caledonia asphalt line striping & stenciling here. When you need a new asphalt driveway or asphalt driveway repair, the professional asphalt driveway contractors at A-1 Asphalt Inc will handle all aspects of your driveway project from start to finish. Learn more about Caledonia driveway paving here. For more information on how A-1 Asphalt Inc’s professional asphalt paving contractors in Caledonia MI can help you with your next project, contact us today or call us directly at (800) 871-4401. We proudly serve Caledonia and the entire West Michigan area. Call Us Today For Your Next Asphalt Project! Get Started!